With summer travel nearly here, California’s Central Coast area offers up both the ideal vacation for families looking to connect, or couples looking for a weekend getaway. Here’s the skinny on how to enjoy California’s Central Coast two ways. Who hasn’t seen Dirty Dancing and thought that a family trip to Kellerman’s would be a great throwback to a simpler time? While time travel isn’t yet possible, escaping to a bucolic 1950s-style family retreat certainly is; at the Alisal Guest Ranch & Golf Resort just outside Solvang on California’s beautiful Central Coast. 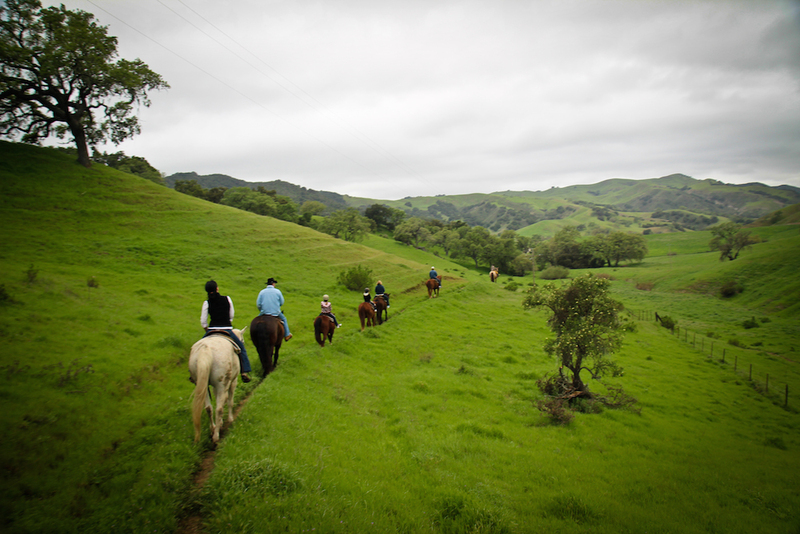 The Alisal is set on over 10,000 acres and the rolling hills provide a natural playground for families looking to connect over pastimes that don’t require an electronic connection. The resort doesn’t have TVs or phones in the room, although free Wi-Fi gives those who can’t do the digital detox a connection to the outside world. But you may decide you don’t want to deal with the real world once you’re ensconced in your bungalow. There are several room types to choose from depending on the size of the family and some rooms are more renovated than others, but all offer ample space and my favorite features of a wood burning fireplace and a shower with such awesome pressure it’ s like a mini-massage each morning. For those who like it quieter, be forewarned: the rooms are not very soundproof; and book bungalow 60, the only stand-alone on the property, and happily my home during a recent stay. One of the most popular activities is a morning horseback ride to breakfast around the campfire. Abe’s flapjacks are the stuff of legend, and he gladly makes the largest pancake you’ve ever seen (to the delight of the little kids lining up for more). The ride is broken up into beginner to advanced groups; ensuring that everyone has a fun time. For those like me who aren’t horse people, a hayride will bring you to the breakfast. 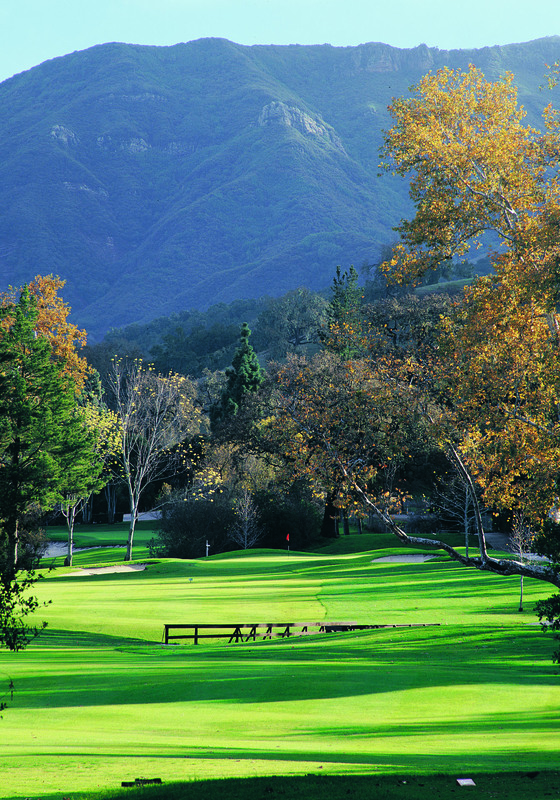 The Alisal is known for its golf, and features two courses: the River – a public course, and the Ranch – a private course. The Ranch course dates the to the 1950s and is ideal for the advanced golfer, while The River course is more forgiving for beginners and families. Both feature views of the Santa Ynez Mountains and River. I enjoy hiking some of the trails, although the front desk person’s warning that bobcats and mountain lions are in the area was in the back of my head throughout the walk. Other outdoor activities that happen on a daily basis are archery and air rifle at the Alisal Lake, tennis, cycling, and guided hikes. There is a pool that is (naturally) popular with the kids. If you happen upon a rare rainy day, as I did, there are movies, arts and crafts, and lectures offered. For couples looking for a romantic getaway, the Central Coast serves up beautiful scenery, luxury hotels, great farm-to-table food, and wine. Lots and lots of wine. While not as famous as an area a bit further north, Central Coast wines made a big splash, thanks to the movie Sideways. While Pinot Noir put this area on the oenophile map, many other varietals grow well here. 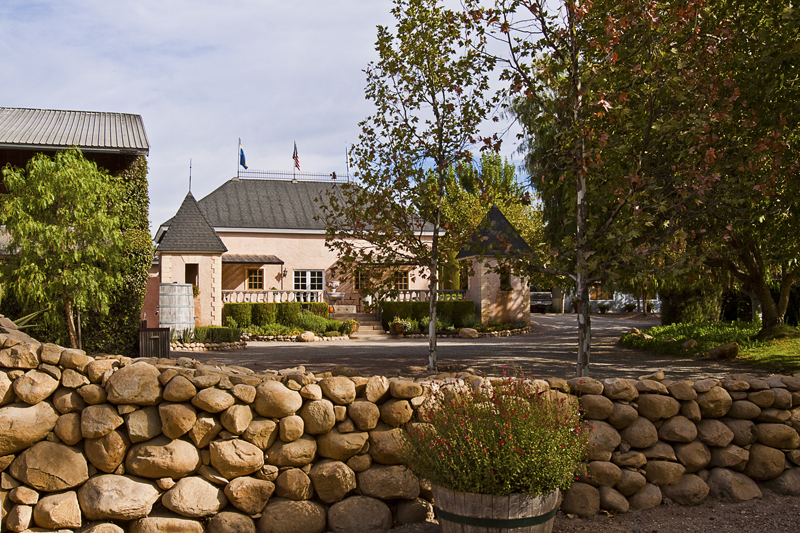 I start my afternoon of tasting at Sunstone, a property that looks like a bit of Tuscany, but the limestone that built it actually came from a small village in France, and the wooden beams and roof tiles came from a lavender factory once owned by Queen Victoria. The wines are made from organic grapes, and I’m surprised at some of my favorites; like the 2013 Grenache Blanc, and the Rose. Couples can even stay at the villa on property. Tres romanitque. From a Tuscan villa built with French stone, to a French looking country home owned by a Swede. Brander wines was my other favorite that we visited. The label is known for its Sauvignon Blanc (and the first we tasted), sourced from Brander’s estate vineyard in Los Olivos. It’s the first time I have sniffed “cat pee”…err…I mean…“gooseberry”, in a Sauvignon Blanc. I say that to my friends who couldn’t believe I came up with that until I Google it, and show them how common a smell it is. Nose withstanding, the wine tastes good, and the 2014 is the 38th consecutive vintage for this wine; clearly a lot of people like…ahem…gooseberry. Being a red wine girl normally, I like the F/Red, a smooth blend of Cabernet Sauvignon, Merlot, and Shiraz. The quaint town of Los Olivos is so charming, one almost feels like it’s a movie set. There are plenty of tasting rooms including Saarloos & Sons, which does a wine and cupcake paring. Red velvet and Pinot anyone? 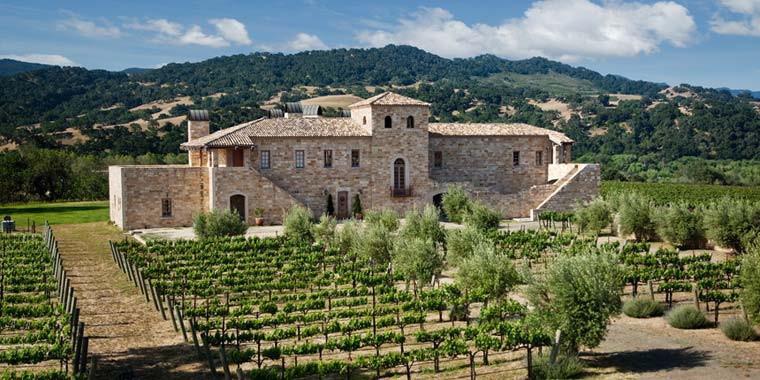 But I’m here for lunch with a girlfriend who works in town, and she expertly guides us to the Zagat-rated Petros in the rustically luxurious Fess Parker Wine Country Inn & Spa. The weather was cool enough to sit by the roaring fire and enjoy a big bowl of Avgolemono soup, and great conversation. Speaking of towns out of a movie, the nearby Solvang is even more so. Settled by a group of Danes looking to escape frigid Midwest winters (Smart Danes) Solvang literally means sunny field. Over 100 years later, the town still screams Denmark: from the architecture, to Danish pastry shops, to a copy of the famous Little Mermaid statue. Naturally, there is a windmill on the main drag. As I wander around town, poking into places like the independent Book Loft and Hans Christen Anderson Museum, I’m stunned by the amount of Asian tourists. My girlfriend tells me that Solvang is especially popular in China, and that the town is a major tourist attraction. She wasn’t kidding, a quick check proved that it gets over one million tourists a year, making it a major attraction in the Sunshine State. One can even buy lederhosen if one is so inclined. No matter the type of vacation you’re looking to do this summer, the Central Coast is sure to please all.